Morgan is amazing! I just got married on Sept 3rd and Morgan did my hair along with my 7 bridesmaids' and 2 mothers' hair. Everyone loved how their hair turned out! Morgan is extremely professional and super sweet. I met Morgan at my hair trial. She was interested in learning more about me and my fiancé. She was very patient with me as we found a hairstyle I loved. I would highly recommend Morgan to any bride-to-be. She made the process very personal, which I loved! Thank you Angela, You and your bridal party were so much fun and a joy to work with! Morgan and her team (Dani and Allison) were phenomenal. I was planning my wedding from afar and Morgan was friendly, professional, easy to talk to, and flexible. I was not able to do a hair and make-up trial, but she worked with me, talking about ideas and helping me come up with a plan. We had a large group too (total of 11 girls including me) getting hair or make-up done - but the day was relaxing and everything went smoothly. Everyone looked beautiful! We could not have been more lucky to have Morgan and our team helping to make our wedding so perfect! Amazing and magical transformation - I couldnt stop looking at myself every chance I got! I hired Morgan to do my make up and although I was sure she was the right one for the job, I honestly had no idea just what a great decision I had made. Being an older woman, I wanted to make sure that she knew what she was doing. Morgan didn't disappoint. She is very knowledgeable about all aspects of make up and beauty tricks. I have been told many times that my skin color is hard to match. Morgan got her foundations mixed a bit of this and that, out and in no time matched my skin color perfectly. That was just the beginning, the contouring was perfect, the eyes were perfectly. The whole look was amazing. Everything came together and I looked like I belonged on the red-carpet. In fact, I was so happy with the results that I can't wait to use her for other formal functions, etc. Well done to Morgan and Metropolitan Makeup. A job well-done. Thank you!!!!! I hired Morgan to do hair and makeup for my wedding 9/26/18. She was so amazing to work with and felt like a friend. She took the time to understand the look that I was hoping to achieve and spent a lot of time making sure that I was comfortable and happy with my results during the trial. She was extremely sweet, responsive, professional, and a pleasure to be around. Metropolitan Makeup is the best! Morgan and her team were incredible!!! I planned my wedding while in grad school three hours from my venue. Morgan was flexible with my schedule for my trial, and she was incredibly responsive to all my questions. I had skin issues the week leading up to the wedding, and Morgan was went above and beyond to help me change my look so I felt comfortable and beautiful on my special day. My bridesmaids loved everyone on the team, and they were raving about their hair and makeup. We had heavy rain on the day of, and our hair and makeup held up perfectly. And to top it all off, they came right to where we were getting ready, so we didn’t have to worry about going to and from a salon. I highly recommend booking Morgan and her team for your wedding!!! Morgan is amazing. She saved the day after my hair and make up people fell through. She is quick to respond and she was very professional. She was on time and was able to keep to the schedule well. I highly recommend Morgan for you wedding hair! I booked Morgan for my engagement photo shoot. She arrived right on time (early to be exact). She was ready to rock n roll upon arrival. She did my makeup and hair for my photo shoot. She did a fantastic job!! To be honest we started at 7am this morning and here it is 10+ hours later, and my makeup and hair are still intacted perfectly! The quality of service I received from Morgan went above and beyond my standards, and I am very happy with the final outcome! Great value and very professional! I cannot wait to work with Morgan in the future. I highly recommend her! Thank you so much for your warm words Kristen! It was a pleasure working with you as well. As someone who hardly ever does anything with their hair other than put it up in a messy bun, and who almost never wears makeup, Morgan was extremely patient, kind and helpful in guiding me through the process of getting all done up for my wedding day. I was able to add and subtract people from the reservation at the last-minute, and she and Mary were excellent with all of the various needs and wants of the ladies in my family, from my 5-year-old niece to my (age redacted) mother. I loved Morgan's flexibility in terms of scheduling and location. Plus, Morgan was sweet enough to laugh at my terrible jokes and overall, I had an excellent time going through a process that is usually quite tortuous for me. My hair stayed up splendidly, and I couldn't be happier with the final result! Morgan is totally lovely and I would definitely recommend her! I loved Morgan so much! She has this cheerful and friendly personality that made me so happy during trial and the actual wedding day! She was so responsive to address my concerns and worked with me to get the perfect natural look I was going for. I got so many compliments on the day of for my makeup and hair, and the makeup and hair stayed on through the whole day even after some emotional moments. I can't recommend Morgan enough! Thank you so much Lacey It makes me feel so amazing that you loved what I did> I loved working with you and your family on your special day. Morgan was so amazing!! She was very open to any of my ideas about hair and make up and was very gentle at the same time! She was very responsive and so easy to work with! I felt so beautiful! Ellyn you are so beautiful inside and out and I am so happy that I got the chance to work with you. Truly an amazing woman and a warm soul, thank you so much for your kind words! I worked with Morgan Monkou and truly could not be more pleased with my experience with her start to finish. Morgan listened to the look I was going for and went above and beyond to achieve the perfect look for our big day. She responded to my bridezilla questions immediately and was very flexible with my payment and schedule requests. My trial went extremely well. Morgan took her time and listened to my feedback. Day of the wedding, Morgan was the calming and positive presence I needed. She worked her magic again and left me feeling beautiful and confident. Morgan exceeded my expectations in every way and is such a warm, kind, and talented professional - I would highly recommend her services! Your the sweetest and had an amazing time working with you as well. I'm so happy that you loved what I did. I truly thank you for your beautiful review. Morgan was a miracle worker for my wedding! My hair and make-up has never looked so good in my life. She was able to take my thick, unruly hair and make a beautiful, loose updo with braids and curls that lasted all night long. Not only that, but the style was super comfortable and I got compliments on it all night long. My make-up was also flawless, beautiful, and stayed fresh-looking all night. On top of all of this, Morgan is such a sweetheart and a blast to talk to. She made the wedding prep so fun and everyone loved her. Booking her for my wedding was the best decision I ever made! I could not recommend her more! Thank you so much Kimberlee! Your thick beautiful hair is a hairdressers dream! I'm so happy that it felt comfortable all night and you loved your makeup as well. You and your family were absolutely lovely and I'm thankful that I got to work with you guys. I highly recommend Morgan! She did our hair and makeup for my daughters wedding and henna party the night before. She is very attentive and knows what looks good and makes sure you love what she has done. My daughter's and I will definitely call Morgan for All our future events! Thank you so Much Feda! I loved working with you and your family too. Extremely professional, kind, and on time! Morgan made my wife Mary Beth look even more stunning if possible, would 100 percent recommend to others! I'm so overjoyed with the excellent work from making my appointment to my makeup. I'm not from the VA but Morgan made everything so easy for me to make an appointment all the way from NYC. Since a saw Deja coming out of her car with a big smile on her face I knew it was going to be a great day. She was extremely nice and make me feel so comfortable. She did an excellent job. So happy that I chose her. I honestly can't say enough good things about Morgan! Just from corresponding with her via e-mail, I knew she was a nice person and someone who I'd feel comfortable doing my hair and makeup on my wedding day. The trial was easy to schedule and, as expected, she was so sweet and put me right at ease. I don't like to wear a lot of makeup and I always wear my hair down. She listened to my needs and came up with a few looks for me at the trial. I ended up changing things a little bit for the wedding day and she had no problem rolling with the punches. My husband and I liked her so much that she even ended up trimming his beard and shaping up his hair on our wedding day too! I got so many compliments on my hair and makeup - it was exactly what I wanted for my big day. Overall, I would say she's a steal money-wise, does a great job, and is a calming and confident presence for anyone like me who's not the most comfortable in the stylist's seat! Laura thank you so much for your kind words, you and you husband were wonderful to work with! It warms my heart to know that you both loved what I did. Congratulations to you both and thank you again! Morgan is EVERYTHING, guys! And when I say everything, I mean EVERYTHING! I could not have asked for a better person to start my wedding morning with. I, wholeheartedly, believe that God puts certain people in your life and Morgan is, definitely, one of them. I had a horrific trial with another “makeup artist” about a week before meeting with Morgan. The trial (with the other person) went so horribly I was convinced I would have to do my own makeup and hair. But something said to not give up. I was scared I wouldn’t find someone with such short notice, but Morgan was so accommodating. Even with her busy schedule she was able to fit me in for my trial and my big day. She was on-time, professional, tons of fun, and handled everything with grace and ease. She gave me her undivided attention and really listened to the vision I had. I was a plus size bride (which won’t matter to most people ready this post), but it means that I was struggling with some body image issues. I felt self-conscience and was concerned that I wouldn’t have a “bridal look.” That was far from the case. Morgan made me look like the absolute best version of myself. I don’t think I have ever felt as beautiful as I did on the days of my trial and wedding. My husband was also a big fan of her work and appreciated that I didn’t look like a complete stranger on our day. She was so kind to everyone that was a part of our event and was really just such a joy to be around. She’s beautiful inside and out. It was such a pleasure working with her and we will be recommending her to all of our family and friends (for special events). Thank you so much Brenda! it was so wonderful to share that connection with you as well. You and your family were so welcoming and it was wonderful to feel so comfortable with you guys. You are truly beautiful inside and out and it was an honor to work with you. Morgan did my make up so beautifully and gave me exactly what I wanted. I provided her with two reference pictures of what I wanted and she was able to combine the two and create the perfect look for me on my wedding day. I was soooo happy! She's was also very sweet and bubbly which made the experience enjoyable. I'll definitely get my makeup done by her again! Thank you so much Candice, I had a beautiful canvas to work with. You ladies were so much fun and I had a fun time working with all of you! Morgan is amazing. She is patient and will work with you until it is a look you are comfortable with. She also will offer an honest opinion if you ask for something completely off the wall without knowing. She always shows up on time and can do a variety of looks on all skin tones. She did my engagement shoot and wedding and I received many compliments for both. I definitely want her to do my maternity shoot when the time comes! Quick note, make sure to book her early, her weekends fill up quickly! Thank you so much Noelle, I would love to work with you again can't wait to do your maternity shoot as well! Morgan is THE BEST! I had a major mishap three weeks before my wedding and needed a hairstylist. My friend referred me to Morgan and, after a great initial phone call and some texting, I hired her. Based on my friend's recommendation and the skill shown in her portfolio, I knew I had to book her ASAP. Boy did she come through! With little spare time before the wedding, we chose to forego a trial. Morgan showed up on site, on time the morning of my wedding and absolutely killed it! I got up to look in the mirror and cried because it was better than my original trial (with a different stylist) and better than I had imagined! Take it from someone who totally took a chance in the eleventh hour—do business with Morgan. You won't regret it! Thank you so much Laura, as an artist it is one of the highest compliments to bring your client to "happy tears." I was overwhelmed with joy when I saw your reaction especially knowing that I was able to bring your vision to life. Honestly your wedding experience made me happier then I think you realized. Thank you for allowing me to be a part of your big day! Morgan was amazing to say the least! I feel like she was the main reason I felt so calm and happy during my Makeup trial and the wedding day. She is such a delight and will keep you sane while making sure you get the look your dreams! Thank you shilpi, It was wonderful to be a part of your wedding day! Morgan did my hair and makeup for my henna party and wedding. She was absolutely amazing. I was especially pleased that by the end of the night my hair and makeup still looked great. Morgan was incredibly sweet and worked really well with my whole family who all looked stunning. She did a great job of listening to what we wanted and using her great skills to make us look even better than we imagined. I am so grateful that Morgan was there for me on two very special days. She made getting ready easy and fun! Morgan is just an amazing artist who listens to what you want and does an fantastic job. She did my hair and makeup for my wedding. 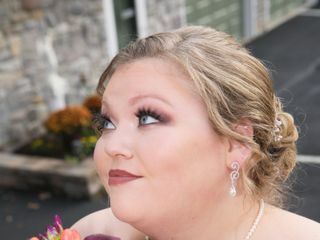 She was so good that my cousin had to get her makeup and hair done by Morgan on her wedding day! Would recommend her for any event! I have known Morgan for 8 years now..... we first met at the trial for my wedding and she subsequently did a FANTASTIC JOB for my wedding day! I felt royal! Since then my family and I have invited Morgan to take part in preparations for every wedding we have had since meeting her 8 years ago. She consistently delivers and her work is AMAZING! So much so that folks that attend our events for which Morgan has done our makeup have asked for her contact info and they are now booking her for their weddings and events. If you want an elegant, classic look and will last throughout your event and make you feel beautiful then Morgan is your makeup artist!